This 2CD set contains the complete 4 Ballades, Impromptus and the Preludes Op.28. The names of these genres were not invented by Chopin, but he gave them a wholly new, original and personal meaning and content. The Ballades are full bodied works in a free narrative form, building up the tension and drama from the contemplative lyrical beginnings to the highly passionate conclusions. The Impromptus are in free A‐B‐A form, and are a fusion of the Nocturne and Ballade style. The Preludes Op.28 are the romantic answer to Bach�s Preludes, each short piece a gem of refined and distilled emotions. Wolfram Schmitt‐Leonardy is one of the finest German pianists of his generation. 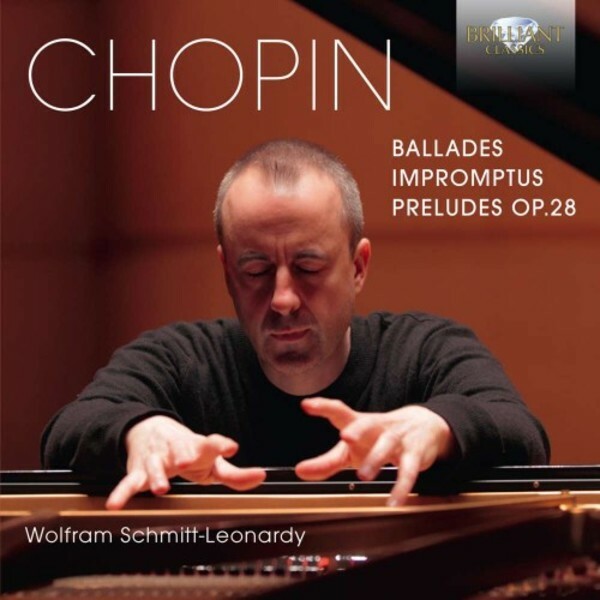 The recording of the Preludes received a 9/9 on Classicstoday - Jed Distler wrote: �he achieves a fusion of impassioned ardoor and classical textual rigor� the best of Schmitt‐Leonardy�s Chopin adds up to a stimulating and compelling listening journey well worth traveling, even if you�ve heard these works hundreds of times�.